Arthur Brown first came to prominence in swinging London in 1967, after spending some time on the Paris underground scene. Arthur was quickly signed to Track Records – upon the advice of The Who’s Pete Townshend – and he released the single Devils Grip, regarded by some as the record that gave birth to the genre we know as Heavy Metal. Arthur is probably best known for his 1968 Number one single “Fire.” It still gets regular airplay all over the world and has been covered by the likes of Ozzy Osbourne,The Prodigy and The Who. 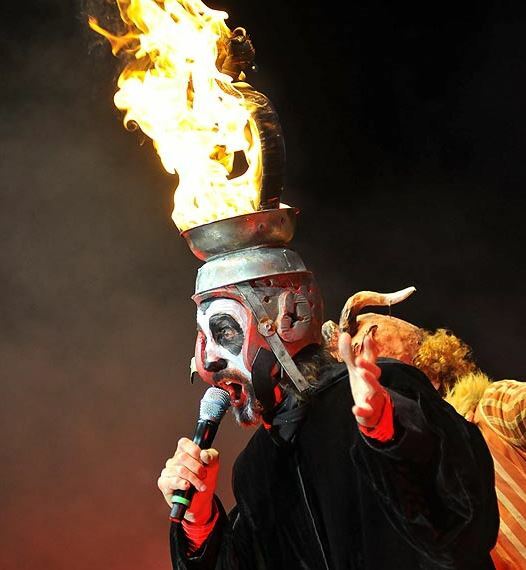 Artists such as Peter Gabriel, Alice Cooper and Bruce Dickenson all cite Arthur Brown as a major influence on them … and in this Arthur’s fifth decade in music … the fire is far from out. The ‘God of Hellfire’ has been busily making his new album and has been seeking donations on his Pledge Music page to make the exciting new project happen. Arthur Brown has always been a risk-taker and an innovator. He promises that his new live act and recordings will include new technologies and things that have not been seen before. When he replaced his drummer with a drum machine in his band “Kingdom Come” in 1973 – it was a brand new idea. So new that people laughed at it. Yet 5 years later, it became what many bands did. It led to the beat boxes and drum machines which have defined much of rock music since then. He says that he is about to introduce a concept that is even more revolutionary than the drum machine – and all will be revealed with the release of his new album. 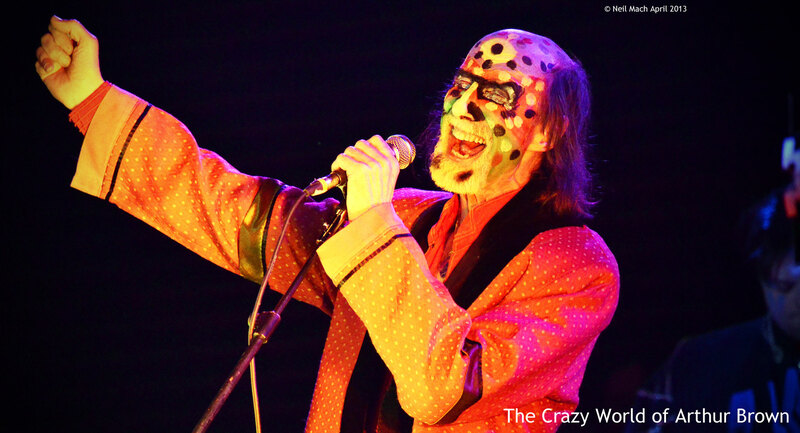 We met up with “The Crazy World of Arthur Brown” at this year’s HRH Prog Festival to have a chat about new technologies, how he keeps himself so fit and how ideas can come to him. PEOPLE WANT TO KNOW HOW DO YOU KEEP YOUR ENERGY LEVELS UP? WHAT IS THE SECRET OF STAYING ALIVE ? Partly it’s the band – they keep me fresh – and it’s so energetic – and it keeps my interest up. Partly I was just born this way. But, as far as my voice goes, I try to sing every day or almost every day. When I’m not running, I do a regimen of exercise and stuff and I walk and dance … so I keep in shape. WHEN YOU SAY YOU DANCE, ARE YOU DANCING FOR EXERCISE? IS THERE ANY SPECIFIC DANCE MUSIC THAT YOU MIGHT INCORPORATE INTO YOUR FUTURE WORKS? Yes, I mean for me I look work forward to working with all kinds of new ideas. Some people, like trying to do a little ‘hip- hop’ and stuff – you know, all the different types of bands out there are doing their thing. For me, I just like to try different things – everything. DO YOU THINK OF YOURSELF AS A MAGPIE MUSICIAN THEN ? YOU GET SOMETHING OUT OF IT? Yeah, I mean why fold up? There’s a friend of mine who used to do Lindy Hop dancing and they were [aged] 70. THAT’S HARD ISN’T IT, IT TAKES A LOT OF TALENT? But it is amazing. The people of that age – if they decide that they are not going to be someone who is going to sit on the couch – they get involved. DON’T YOU HAVE ANY ACHES AND PAINS THOUGH? AND THE VOCAL EXERCISES THAT YOU DO, IS THAT A WRITTEN DOWN EXERCISE ? No, no, what I do is take the bits and stuff that I do on stage or the bits that are already written and I sing with them. Sometimes I have to do a sound check and sing along with it. I play the guitar and keyboards and sing with it. I am not a great keyboard player or guitarist but I can sing along to all of them, you know. What I like to do is go into the middle of some heavy traffic, where no one can hear [me] sing – and I sing as loud as I possibly can and nobody can get upset. If you do it in your room there is always a neighbour who is going to get angry! DO YOU STILL WRITE NEW SONGS? ARE YOU COMPOSING MUSIC ALL THE TIME? … It just comes out. Yes it is because my interests are so varied. Ideas come to me all the time. It feels like I have listened to culture all my life … perhaps I might not have taken it all in… but still. Things works to inspire me, even though [perhaps] I’m not aware of things influencing me. SO WHAT WOULD INSPIRE YOU? I SAW A DOCUMENTARY ABOUT THAT. Yeah, great. So we got one called “Naked Man” on the new album. Plus what’s going on in the world … options change and there might be a way of dealing with something because technology is offering new solutions. The way technology’s going, our work, our reactions to love life … even our relationships might be affected by technological advances … … All kinds of things. I SUPPOSE LOVING RELATIONSHIPS – WHICH HAVE BEEN AROUND SINCE CAVEMAN TIMES – HAVE NOW CHANGED BECAUSE OF TECHNOLOGY… TECHNOLOGY HAS CORRUPTED SOME OF OUR MOST BASIC AND VALUABLE THINGS. YEAH, PEOPLE DON’T REALLY COMMUNICATE AT ALL. But , on the other hand – if you look at it from another point of view – we have built our civilization on individualism, on separate phrenology, people are separated from each other in their radical ways … but internet and technology makes it impossible to have privacy so that it is cancelling a lot of that out, and people say that it is a virtual world, it may well be a virtual world, but it is a world in which everyone has to participate. So I think there’s a change coming which will affect all relationships, and will affect all politics. You know, hey, politics are in a complete mess, nobody has an answer, all the old answers, all the old financial systems, are a waste of time and we’re still having to live with them because nobody has thought of anything else that everybody believes in, but all of that will change and so the album has a bit of that in it. ARE YOU SAYING ALL THIS OPTIMISTICALLY ? ARE YOU SUGGESTING THAT MAYBE WE COULD TAKE POLITICS INTO SOMEWHERE ELSE… INTO A WIDER COMMUNITY? AWAY FROM THE STATE ROOMS AND CABINET OFFICES? AND KICK THE OLD MEN OUT AND GET THE ENERGETIC AND YOUTHFUL PART OF THE COMMUNITY INVOLVED? Exactly, and the image you get of the world where the internet is, it’s one world and, you know, it’s inevitable that it’s going to be a world government [in the end]. And we need it because there’s all these strange things … like North Korea going off … you know, it’s like well, okay, we could threaten you with a nuclear bomb, next Thursday, so let’s do it. So I think it’s good to have the politicians realise that they cannot just go off and do things just because they have the power. No, they have to answer to the people … like there’s a huge “advice organisation” on the internet there [might be] 20 million people all saying together, “No, we don’t agree with this…” And the politicians are having [to get to realise] that they must start listening.